First Aid Level 3 Training in South Africa. Get A Free Quote Today! First Aid Level 3 is a very in depth training course. With this level, you will learn everything taught in level 1 and 2. You will learn in depth theory regarding all the injuries listed in the other levels. First Aid Level 3 will go as far as delivering a baby. This level will not be required for everybody. We usually suggest this level if you want to become a paramedic. If you want to become an ambulance assistant, this will be a great place to start. In First Aid Level 3, you will need to know the names of all the bones and blood vessels in the body. You will even need to know what direction the blood flows through every blood vessel. The theory is very intense, and you will have to write a written exam in order to get your qualification. This level is mostly aimed at theory. You will, however, do some practical. 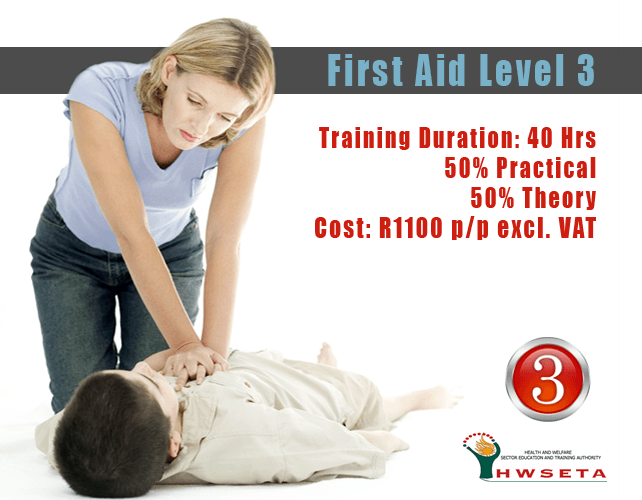 In order to qualify for this course, you are required to have a valid level 2 first aid certificate. You also need to have at least a Grade 8 or equivalent qualification. First Aid Level 3 will not be required by the department of labour. The same as with level 2, you will learn a few additional injuries. Evaluation of the Patient’s Condition. Artificial Respiration for an Adult, Child and Infant. One and Two Rescuer CPR for an Adult, Child and Infant. Soft Tissue Injuries; Wounds and Bleeding. Fractures and the Threatened Limb. Joint Injuries and Rescue Transportation. Pelvic, Abdominal and Crush Injuries. Epilepsy (Fits), Breathlessness and Skin Reactions. Ethics Related to Emergency Care. The Legal Aspects of First Aid. If you are interested in taking your first aid skills to the next level, feel free to contact us. This course can be attended by both groups and individuals. We do not run this course as often. If you are an individual interested in the course, we will include you in an existing group.